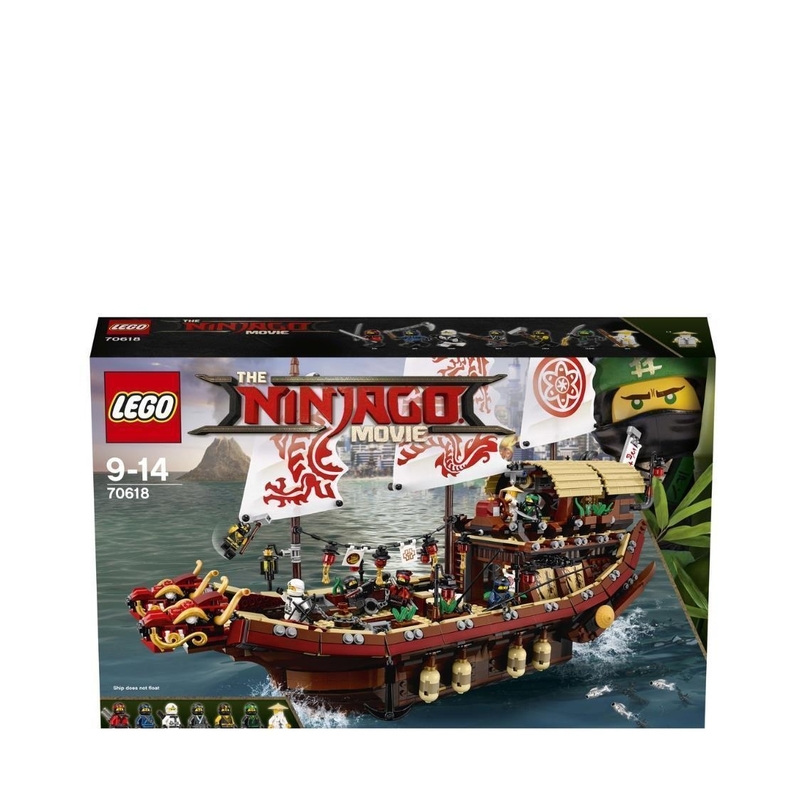 - Includes 7 minifigures: Wu, Kai, Lloyd, Zane, Nya, Jay and Cole. 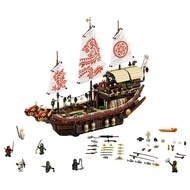 - Destiny’s Bounty features 3 modular levels (top deck, Wu’s dojo and mid-deck/hull), a double-headed dragon figurehead, 3 decorated sails, a chain of lanterns, 2 wind-up-and-release anchors, sky pirates skull handle, 2 barrels and 3 crates, Wu's bedroom with a bed for a minifigure, and a bathroom in the hull, dojo with a scroll, training dummy and 3 training weapons, plus hidden weapons under the deck. - Weapons aboard Destiny's Bounty include the laser-style pointer, 4 golden sais, 2 golden katanas, 2 silver katanas, crossbow, black stone warrior sword, 2 golden shurikens and an Aeroblade with golden blades. - Minifigure weapons include Wu’s staff, Kai’s 2 katanas, Lloyd's tasseled sword, Zane's bow and arrow, Nya's tasseled spear, Jay's spiked flail and Cole's hammer. 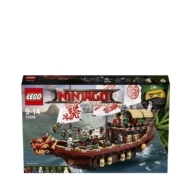 - Accessory elements include 3 books, a broom, shovel, big telescope, handheld telescope and 2 fishing rods, Vermillion armor, Garmadon's skeleton helmet, Anacondrai skull helmet, letter to Misako, 4 fish, 2 collectible cards, map of NINJAGO® world and a sextant. - Destiny’s Bounty measures over 17” (45cm) high, 21” (55cm) long and 6” (17cm) wide.